Over the years, Chapman and Cliff have undertaken many special commissions using customer's patterns, drawings and ideas to create unique vehicle interiors. From using different veneers to the original or cross banding and inlays which can complement the vehicles trim colour, to manufacturing one off items or even veneering parts that were not previously veneered or lacquered. Depending on the condition of the original woodwork received, Chapman and Cliff will either complete a minor repair, a re-lacquer or offer a total replacement, ensuring in every case that the end result is to concourse standard. Most incidents of woodtrim deterioration are caused by sunlight, water leaks and damp. Discolouration, cracks in the veneer and missing lacquer are all possible consequences. Remove the existing veneer and lacquer the former by careful use of selected solvents or the application of heat, the latter by skilful hand sanding using 4 grades of sand paper to leave a smooth surface with no visible scratches. Special attention is paid to avoid sanding through the veneer down to the substrate. Make the necessary repairs, which may include filling unwanted holes, chips, repairing rotten woodwork, cracked or discoloured veneer. Re-manufacture any missing parts using drawings or patterns derived from the original if repairs are not possible. Veneer bonding 0.6mm thick veneer of choice to panel by means of applying a thin layer of finest quality exterior wood glue accompanied by vacuum pressing for curved shapes or screw pressing for flat shapes. The excess veneer is filed and skilfully hand-sanding using four grades of sand paper to leave a perfectly flat surface with no visible scratches. The visible edges are hand-painted or stained. 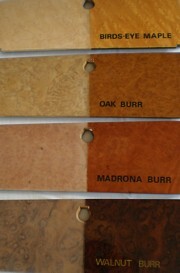 Customers can match to the original, or choose from a large selection of veneers to personalise your interior. Lacquer requires an initial spray coat of primer and allowed to dry. Next 4-5 coats of polyester lacquer are sprayed onto each part, depending on the porosity of the veneer. It is allowed to harden over a minimum of 4 days to allow the lacquer to cure, harden and fully penetrate the wood. Five different grades of sand paper (to 1000 grade) are used to hand-sand each item, to leave a perfectly flat surface. This process is completed by polishing. Polish by hand and followed by finishing on a polishing mop to ensure a perfectly flat, mirror finish. A final hand wax is applied to seal the wood providing additional, on-going protection. The final result is a highly durable, deep, mirror finish, which is long-lasting and aesthetically pleasing. Due to the attention to detail required to achieve the results you require, please allow a minimum of 4 weeks for works to be completed.